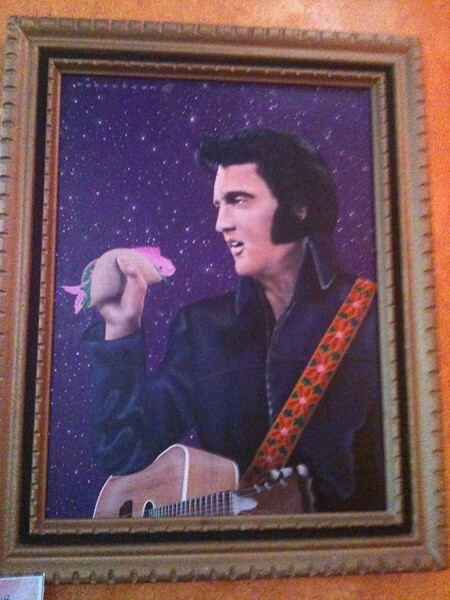 This is what passes for fine art at one of the restaurant bars near me. At least it’s not on black velvet. Would have preferred he was holding a peanut butter, banana grilled sandwich. My granddaughter brought me( from L.A.) a coffee cup with little Elvis’ in his gold lama suit all around it. She remembered I really liked him when I was a teen. I remember you taking me to see his movies at the drive-in.